Trading of Coffee Making Machines, Tea, Hand Towels and Dryers, Sprays etc. 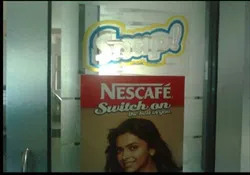 Established in the year 1988, we, Snap Marketing Private Limited, are one of the distinguished suppliers, distributors and traders of a broad assemblage of Vending Machines and Water Coolers. Our product range consists of Nestle Premix, Aquaguard Purifiers and Water Coolers that are manufactured in compliance with the set industry guidelines, at the location of our esteemed business associates. Our company holds the Authorized Vending Franchise for Nestle Vending Machines & Consumables and Authorized Channel Partnership for Kimberly Clark Hygiene Products Pvt. Ltd, for Pune region. Because of the good financial position & TQM and large product line too, we have gained immense success. Our company has established a magnificent warehouse that comprises of modern & advance technology based machines, tools and equipment that support us with the obstruction-free storage and loading & un-loading of the proposed assemblage. Furthermore, in our efforts to achieve client satisfaction, our experienced team members, have always played an important role. We are extremely famous in the business and have earned a long list of clients, which includes Infosys Private limited Company, Pune, Maharashtra and Deenanath Mangeshkar Hospital, Pune, Maharashtra. Under the unparalleled leadership of our Manager, Mr. Lokesh Arya, we have achieved great heights in the industry and earned a vast number of customers. Because of the regular guidance and constant motivation of our mentor, we receive inspiration to put in our best efforts and accomplish the organizational goals, with enhanced efficiency. Owing to sound experience of this domain, we have realized the importance of team members for the success of any organization in a long run. This is why, we pay utmost attention while recruiting these experts. These professionals have mastered the complete know-how of their respective fields. Moreover, they make sure to complete the task assigned to them within the postulated time frame. Besides, they work in close consort with each other to maintain conducive environment within the premises. Nestle India Limited and Kimberly Clark Hygiene Products Pvt Ltd. are our famous business associates. With the support of our associates, we have been able to establish our name in the business. Being some of the leading names of the industry, our associates are extremely mindful with the quality that is proffered at customers’ end and thus, use quality grade raw materials for the manufacturing process and follow the industry norms. 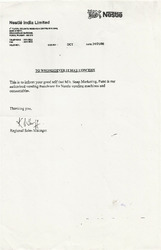 Snap Marketing Private Limited is one of the eminent names of the market. Our company has always followed the strategy of proffering a perfect amalgamation of quality and price. With the help of modern and latest technologies, we are able to offer supreme equality range, as per the commitments. Following a client-centric approach, we have strived to accomplish organizational goals, without compromising at the quality front. 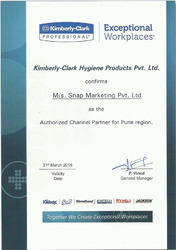 Kimberly Clark Hygiene Products Pvt Ltd.